When visitors land on a website, the first thing they do is mentally evaluate in an instant whether they can trust the information on the site enough to continue. Like all information, this is a matter of whether or not the source of the information can be trusted to overcome perceptions of risk, uncertainty and even possible identity theft. Trust or no trust happens during the visitor's initial impressions or "first glance" at a website when visitor is still unfamiliar with the vendor. In people to people interaction, we evaluate the person doing the talking before we accept the person's message. On a website, we evaluate the company behind the information. The company is evaluated at "first glance" during the first three seconds of a website encounter. But on a website, the initial period of trust is not based on personal experience with the vendor. The visitor and vendor do not have a personal relationship history. The visitor makes a trust evaluation on what information, verbal and visual, is available. Otherwise, the vendor is faceless. What do visitors look for during this critical period? Research indicates that perception is done at "first glance" and on the basis of whether the company is considered credible or not. Further, visitors look for what is termed "surface" cues for credibility. Stanford University web credibility researcher, Dr. B.J. Fogg, describes "surface credibility" as simple inspection of surface traits non-verbally communicated by visual design. In people to people communication this would be how a person looks, his or her dress, or hairstyle. Whether the person is neat or sloppy. These are "surface credibility" characteristics. We often hear the phrase, "you don't get a second chance to make a first good impression." Why is a first impression of people important? We trust or don't trust the credibility of people upon first meeting. This leads to accepting, or not accepting, what they have to say. The same is true at the moment of "first glance" at a website, except we look at the how credible the company logo and home page looks through non-verbal design elements. In an instant. This is critical for continued website success. The objective is to turn visitors into trusting customers who move on after "first glance" within the website for the purpose of purchasing a product or service. Wrong imagery. An ambulance company shows its product in Heaven. Why visitors move on. Website studies on visitor use conclude that over seventy per cent of visitors leave at "first glance" if they do not consider a website credible. On the positive side, my PhD research concluded that four times as many visitors will continue as conversion rate customers if a credibility-based logo is on the company website at "first glance" compared to a non-credible logo. 1. Show that there is a real organization behind the website, as an honest trustworthy company. This is done most effectively with a credibility-based logo design sm representing the company. The credible company logo is usually in the upper left hand corner of the website. Perception theory in communication persuasion suggests that people immediately want to know the source of the message which follows. Just like when we often look first for the name of the person on an envelop or post card. Similarly, visitors to a website look at the company logo, or search for the company name if there is no logo, at "first glance." 2. Show that there is a credible organization behind the website with an appropriately designed home page. A company website home page must be designed with the same appropriate credibility traits as in the company logo. This will also give consistency in credibility traits important to the company behind the website. Logos and home pages are perceived almost simultaneously. People perceive the "whole" before they perceive the parts. Although the eye will go immediately to the company logo or name (as a part) after perceiving the "whole" or overall visual character of the home page. Thus, the company credibility-based logo design and the home page design must have a consistency in credibility design "look." For example, the logo cannot have a contemporary design and the home page a dated design. The bottom line is that the whole visitor perception, logo and home page, must communicate credibility to assure the visitor continues at this initial web experience --- at "first glance." These first impressions are key to trust building and continued visitor conversions to being a customer. Powerlogos Design is the only creative and research based logo and home page design firm using proven principles in source credibility in communication persuasion to optimize online marketing. We call this Website Optimization at First Glancesm. The process we use is termed credibility-based logo designsm and credibility-based website designsm. Started as an online firm in 2001, Dr. Bill Haig maintains the philosophy that logo and home page design apply proven communication persuasion principles enabling clients to have the assurance that their company logo and home page will be successful at "first glance." A unique and inexpensive logo and home page test methodology can be used for further, data based, assurance. Powerlogos Design analyizes and plans client credibility traits before design commences. A questionnaire is provided and a Logo Planning Report is prepared which includes a verbal description of the design objectives for the new credibility-based logo and subsequent home page. The company uses top international designers to interpret the objectives and create the preliminary and final designs. The result is a new logo and home page which works, done efficiently based on a mutually agreed upon plan, then created by top designers --- all under the supervision of Dr. Bill Haig. Dr.Haig is a specialist in source credibility in communication persuasion principles applied to logo design, website credibility and online testing. He has over forty years experience in logo design and recently obtained his PhD applying his logo knowledge to website credibility and online testing. He developed a unique online logo and home page testing methodology during three years of university supervised research. or by phone at 808 922 4042 (Hawaii Time.) Visit www.powerlogos.com for more articles and Dr. Haig's book on credibility-based logo design and website credibility. Stay tuned for part two of this article! Kevin Eikenberry has written a new book on leadership. It's called Remarkable Leadership: Unleashing Your Leadership Potential One Skill at a Time. This book is practical, inspiring, relevant and real. It introduces 13 leadership competencies, as the title says one skill at time. And while it is a leadership book, and will help anyone regardless of their leadership experience become more effective, it isn't just for leaders. This is a book for all of us, because all of us are leaders. And as Kevin says in the book, when we become better leaders, we become better humans. I'd recommend this book to you any time, but never more urgently than today. Because when you invest in the book today, you will receive more than 50 tools and bonuses from Kevin's expert colleagues from around the world that all will help you become a more remarkable leader. (I threw in a gift as well because I wanted to help Kevin spread the word about becoming a Remarkable Leader). All of these tools are yours just for buying the book today. And while you will have wait for your book to arrive, these other tools are available right now (sometimes it pays to be impatient). Excerpt from Kevin Eikenberry's new book "Remarkable Leadership"
1. Close your eyes, think of the most effective leader you know, and get a mental picture of him or her. This person can be alive or dead, someone you know personally or have only read about or observed from afar. Whoever it is, see the person in your mind's eye. 2. Make a list of the behaviors or skills that this person exhibits-the things that make him or her so successful as a leader. After people complete this simple exercise, I ask them to share the skills and behaviors they have identified. The lists I hear are long and cover many of the competencies explored in this book-except one. The skill that is almost always is missing from these lists is being a lifelong learner. There is absolutely no question in my mind that being a continual learner is a key skill for leaders. In fact, I believe that it is the most important skill of all for leaders, yet it usually doesn't make people's lists. Why don't people consider learning and add it to the list of traits of great leaders? Because it is the underlying skill-the skill without which improvement in any other area is nearly impossible. If leaders aren't learners, they can't be remarkable. Perhaps learning is a skill that we don't think about because it is assumed, considered a given, or deemed obvious. Whatever the reason, it doesn't change the fact that we must start with learning. And while we all know how to learn, remarkable leaders know that because it is the underlying foundational skill, as they get better at it, it will help them in all of their other leadership development efforts. Each level of the pyramid is a factor in the perception of credibility and potentially a point of competitive differentiation. Each of these criteria for success is used by editors and analysts, influencers and customers (consciously or not) to determine the validity of a company and its products. Word-of-mouth credibility often starts here. If the foundational perception is continually validated through each level of the pyramid, word-of-mouth credibility soon follows. 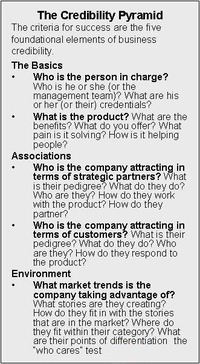 This model encourages a closer look inward to identify the areas where the company needs to reinforce its standing and authority. This does not mean manufacturing “spin” but employing a business strategy that enables the company to “be” credible, not “do” credible. This process becomes the starting point for market acceptance and ultimately generates the kind of awareness that influences market perception and acceptance. When an influencer, analyst, media representative, or venture capital firm is auditing a company, these two core areas (management team and a great product) are the first things they will review, and it is important to have these pieces in place and to have messaging that accurately describes this important information. Oftentimes a company in the early stages of its lifecycle will not place enough importance on these foundational points of credibility. For example, the product may be amazing, but the company executives may not have taken the time to identify the deeper market opportunities or to offer information that expresses the clear benefits and return on investment customers will experience. They may not have clearly articulated the market need; even if the market need may be obvious to the founders, it may not be to the investors, the press, or the influencers you want to attract. Next on the pyramid is identifying key customers and high-profile partners who can attest to the strengths of the company and its products. These are two crucial criteria for gaining credibility within the press and analyst communities and customers for that matter. If customers like IBM or Coke are saying yes to your product in the corporate world, or well-known influencers like celebrities or industry experts are saying yes in the consumer world, then new customers will say yes and say yes much faster. Sometimes you might be in a position to pursue or choose the “right” customer, let me give you an example of what that means. I was working with two clients that offered complex technology solutions. We were charged with generating press articles for them to increase the credibility factor and attract customers. One company had done very well with sales and garnered a decent volume of customers. The other had one customer. Now, who do you think got the most press coverage? You would think it would be the one that had a volume of customers, right? It would make sense that more people were buying from that company, so it would seem to be more successful and thus have more credibility. In fact, the client with one customer received the most press articles. That was because that company had a board of directors that had industry luminaries on it, it brought in a CEO who was well known in the industry, and its one customer was one of the top 10 brand names in the world. Having this well-known customer added tremendous credibility. “If that brand-name company will buy it then it must be good” is the thinking in the market. The top of the pyramid —the unique market trends—is a little harder to control, so it is almost more important to manage. Doing homework and identifying the trends that are unique to the sector, is an important tactic for credibility PR. A focal point is identifying what competitors are doing, not from a feature/benefit standpoint but from a perception analysis. For example how are they positioning themselves through their press releases and publicity programs? How is the editorial community covering these companies, are they buying the spin or not? (See post “Market Research – Moving Beyond the Calculator --and a case for Credibility Branding” for additional details) From this market intelligence identifying how to position the company within this landscape is an easier more comprehensive exercise. Credibility Pyramid tool to identify the holes in your company’s credibility criteria. Leverage these points of credibility wherever possible to capture the imagination of new customers, impress the influencers, and overcome the objections of the skeptics. By using this model and establishing more credibility for your company and products, you will see a marked change in the speed of sales. You will have the tools at hand to allow your sales team to convert sales faster –credibility (AKA trust established through influencer endorsements) is often the factor that closes the sale. This is part of the Crediblity Branding model, you can learn more about influencing the influencers with a new CD (FREE) that you can access at: www.brandperceptionaudit.com. When visitors land on a website, the first thing they do is mentally evaluate in an instant whether they can trust the information on the site enough to continue. Like all information, this is a matter of whether or not the source of the information can be trusted to overcome perceptions of risk and uncertainty. Trust or no trust happens during the visitor's initial impressions or "first glance" at a website when visitor is still unfamiliar with the vendor. 1. Show that there is a real organization behind the website, as an honest trustworthy company. This is done most effectively with a credibility-based logo designsm representing the company. The credible company logo is usually in the upper left hand corner of the website. Perception theory in communication persuasion suggests that people immediately want to know the source of the message which follows. Just like when we often look first for the name of the person on an envelop or post card. Logos and home pages are perceived almost simultaneously. Thus, the company credibility-based logo design and the home page design must have a consistency in credibility design "look." For example, the logo cannot have a contemporary design and the home page a dated design. The bottom line is that the whole visitor perception, logo and home page, must communicate credibility to assure the visitor continues at this initial web experience --- at "first glance." These first impressions are key to trust building and continued visitor conversions toward being a customer. Powerlogos Design is the only creative and research based logo and home page design firm using proven principles in source credibility in communication persuasion to optimize online visitor to customer conversion rates. We call this Website Optimization at First Glance. The process we use is termed credibility-based logo design and credibility-based website design. Started as an online firm in 2001, Dr. Bill Haig maintains the philosophy that logo and home page design apply proven source credibility principles in communication persuasion. The result is that clients have the assurance that their company logo and home page will be successful at "first glance" giving trust to the website company. Dr. Haig has over forty years experience in logo design and recently obtained his PhD applying his logo knowledge to website credibility and online testing. He developed a unique online logo and home page testing methodology during three years of university supervised research.